I have decided to experiment a little bit this week. I chose a nail polish, Essie Lapis of Luxury and I'll try and use it to post a different combo each day until sunday. Today I have a matte rainbow of flakies with one of the Golden Rose Scale Effects. In case you're curious, you can see the whole Scale Effect collection review here. This particular one, 01, is a green to orange and yellow flakie when hit by the light and pink to purple and blue otherwise. Flakies over pastels... That's my favorite way to wear them! But I must confess that I've always loved them even better mattified! 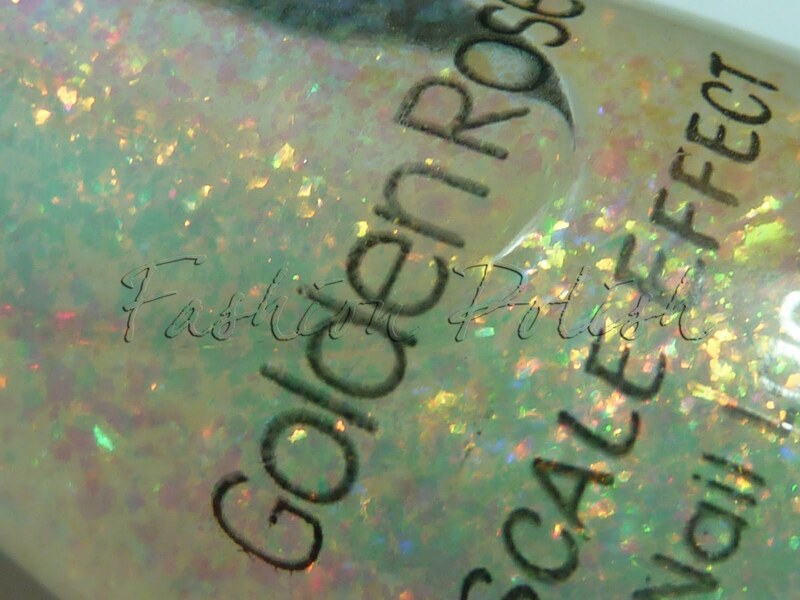 What's your favorite base color for flakies? This is GORGEOUS!! I need to find some flakies somewhere, dying for them. Wow! It looks great! 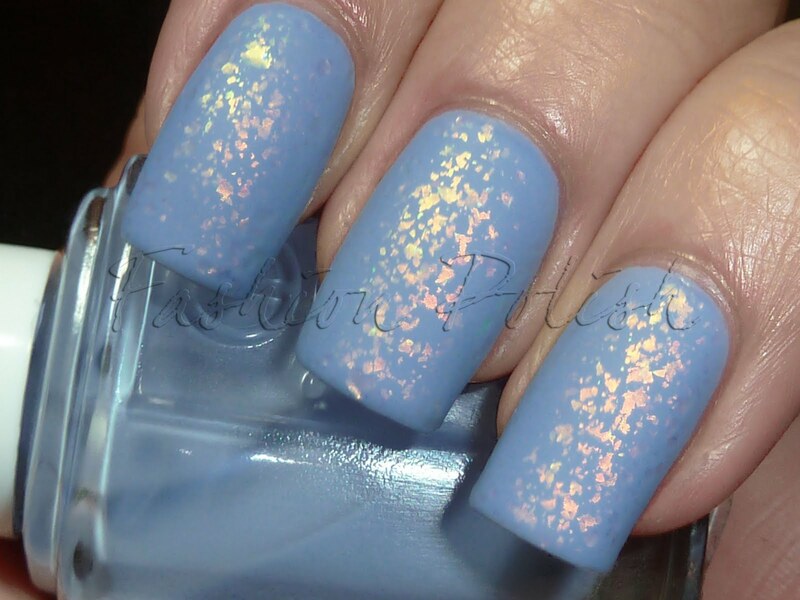 I must say that I've never tried flakies over pastel colors. I usually use flakies over dark colors (black is my favorite). gorgeous! I especially love it matte! 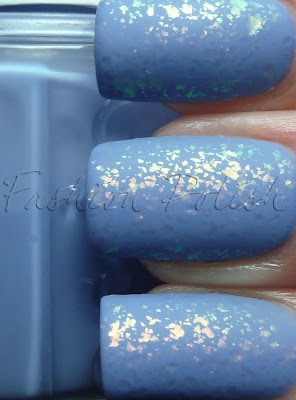 I agree with Angelique, I have never thought of using flakies over pastels. This is a nice look! Another one who never thought of using it over pastels. AWESOME idea. I do the matte thing cuz I like matte often on my nails. Very well done. I love the flakies. Though I'm still coming around to matte finishes, this actually looks really stunning. Nice job! Beutiful! As the other girls said, it's something different, everyone uses flakies over blacks and dark colors, this is more subtle but looks great too! So gorgeous! I'm now seriously lemming both these polishes! Question though - I read that round nails are "in" again - would you change your nail shape according to fashion? Wow it reminds me of a mermaids tail or something. It's gorgeous! I don't own a flakie..I so want this. I love how it looks mattified. I need to try that with HT. Oh my... I never thought of mattifying my flakey! Hi girls, I'm happy you like the flakey over pastel look and the matte version!